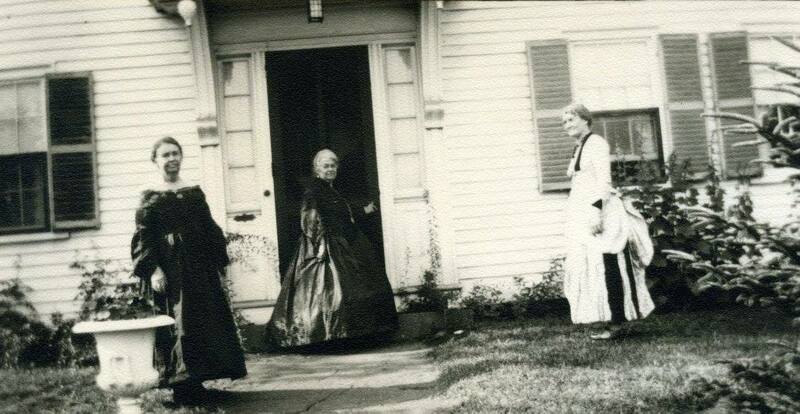 The woman standing at the center wearing a black dress & hoop skirt is Mabel Hartwell Winn. The one on the left, behind urn, is miss Florence Harris, and the one on the right in a two-toned dress in bustle is Miss Alice Kelsey (she later lived with Mabel Hartwell Winn for a while). The occasion is a party inviting all the people who went on a European tour with Mabel Hartwell Winn in 1930. They often dressed in these costumes & showed a lot of antiques. The dresses are now in the Smithsonian.